Well hello there! Its been a long time I know ... and I apologise. Life has not allowed me any time for craft, blogging or much leisure ... but things are settling down. The latest challenge over at Crafting For All Seasons is Buttons and Bows. We are being sponsored by Bugaboo who are going to give our winner a lovely prize. 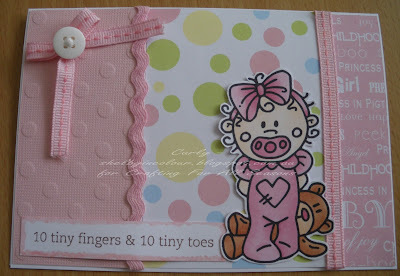 I have used this super cute image from Bugaboo called Boo - Teddy Bear which you can find here. Be sure to check out the rest of the Design Teams gorgeous Button and Bow projects and then get your own entry in at the Challenge Blog. A sweet and adorable card. Carly this is just soooooo cute!